Aussie Rules is based on Australian Rules Football (What Rules?) Whilst in the game there is a musical jingle with drum beat playing in the background. Ausstralian Rules Football has no offside rule and no rules on formation unlike other Football games, the players are free to roam anywhere on the ground, there are very few rules in Aussie Rules which allow players to use any part of their body in a tackle. 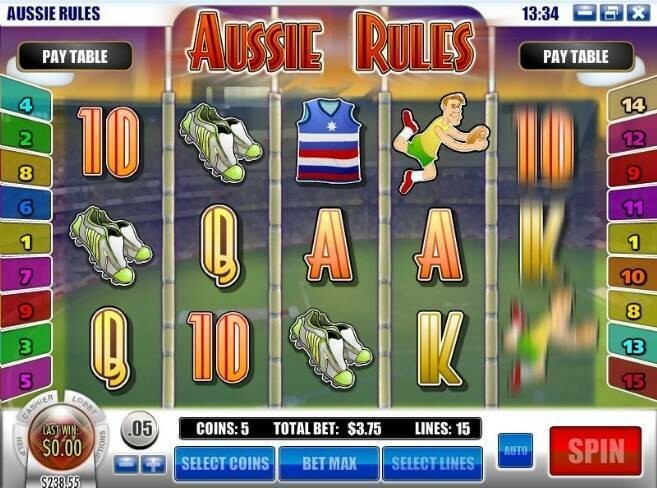 On the reels there are the normal high value playing card symbols, there are also themed symbols such as the Aussie Rules football player diving to catch the ball, the lines man dressed in white with his white flags that he waves when he is part of an active winning payline, the referees whistle, a players water bottle (used to activate the free spins feature), a players football top, a players pair of football trainers and the Aussie Rules football itself that activates the bonus round. There is a jackpot of 5000 coins that can be won by getting 5 lines men in a row on an active payline. This game also falls under the category of a penny slot as you can bet a cent for a single spin. This game was launched in July 2010.